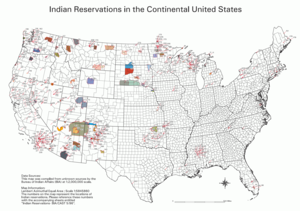 BIA map of reservations in the United States. An Indian reservation is an area of land managed by a Native American tribe under the United States Department of the Interior's Bureau of Indian Affairs. Because Native American tribes have limited national sovereignty, laws on tribal lands vary from the surrounding area. These laws can permit legal casinos on reservations, for example, which attract tourists. There are about 310 Indian reservations in the United States, meaning not all of the country's 550-plus recognized tribes have a reservation — some tribes have more than one reservation, while others have none. In addition, because of past land allotments, leading to some sales to non-Indians, discussed below, some reservations are severely fragmented. Each piece of tribal, individual, and privately held land is a separate enclave. This jumble of private and public real estate creates significant administrative and political/legal difficulties. The collective geographical area of all reservations is 55.7 million acres (225,410 km²), representing 2.3% of the area of the United States (2,379,400,204 acres; 9,629,091 km²). Twelve Indian reservations are larger than the state of Rhode Island (776,960 acres; 3,144 km²) and nine reservations larger than Delaware (1,316,480 acres; 5,327 km²). The Navajo Indian Reservation compares toWest Virginia. Reservations are unevenly distributed throughout the country; the majority are west of the Mississippi River and occupy lands that were first reserved by treaty or 'granted' from the public domain. The tribal council, not the local or federal government, generally has jurisdiction over reservations. Different reservations have different systems of government, which may or may not replicate the forms of government found outside the reservation. Most Indian reservations were established by the federal government; a limited number, mainly in the East, owe their origin to state recognition. At the present time, a slight majority of Native Americans and Alaska Natives live somewhere other than the reservations, often in big western cities such as Phoenix and Los Angeles . In 1851, the United States Congress passed the Indian Appropriations Act which authorized the creation of Indian reservations in modern day Oklahoma . Relations between settlers and natives had grown increasingly worse as the settlers encroached on territory and natural resources in the West. By the late 1860s,President Ulysses S. Grant pursued a stated "Peace Policy" as a possible solution to the conflict. The policy included a reorganization of the Indian Service, with the goal of relocating various tribes from their ancestral homes to parcels of lands established specifically for their inhabitation. The policy called for the replacement of government officials by religious men, nominated by churches, to oversee the Indian agencies on reservations in order to teach Christianity to the native tribes. The Quakers were especially active in this policy on reservations. The "civilization" policy was aimed at eventually preparing the tribes for citizenship. Many tribes ignored the relocation orders at first and were forced onto their new limited land parcels. Enforcement of the policy required the United States Army to restrict the movements of various tribes. The pursuit of tribes in order to force them back onto reservations led to a number of Native American Wars. The most well known conflict was the Sioux War on the northern Great Plains , between 1876 and 1881, which included the Battle of Little Bighorn . Other famous wars in this regard included the Nez Perce War. Most Indian reservations, like the Laguna Indian reservation in New Mexico (pictured 1943), are in the western United States, often in arid regions unsuitable for agriculture. In 1887, Congress undertook a significant change in reservation policy by the passage of the Dawes Act, or General Allotment (Severalty) Act. The act ended the general policy of granting land parcels to tribes as-a-whole by granting small parcels of land to individual tribe members. In some cases, for example the Umatilla Indian Reservation , after the individual parcels were granted out of reservation land, the reservation area was reduced by giving the excess land to white settlers. The individual allotment policy continued until 1934, when it was terminated by the Indian Reorganization Act. With the establishment of reservations, tribal territories diminished to a fraction of original areas and indigenous customary practices of land tenure sustained only for a time, and not in every instance. Instead, the federal government established regulations that subordinated tribes to the authority, first, of the military, and then of the Bureau (Office) of Indian Affairs.. Under federal law, the government patented reservations to tribes, which became legal entities that at later times have operated in a corporate manner. Tribal tenure identifies jurisdiction over land use planning and zoning, negotiating (with the close participation of the Bureau of Indian Affairs) leases for timber harvesting and mining. Tribes generally have authority over other forms of economic development such as ranching, agriculture, tourism, and casinos. Tribes hire both members, other Indians and non-Indians in varying capacities; they may run tribal stores, gas stations, and develop museums (e. g., there is a gas station and general store at Fort Hall Indian Reservation, ID, and a museum at Foxwoods, on the Mashantucket Pequot Indian Reservation in CT). Tribal members may utilize a number of resources held in tribal tenure such as grazing range and some cultivable lands. They may also construct homes on tribally held lands. As such, members are tenants-in-common, which may be likened to communal tenure, but keep in mind, even if some of this pattern emanates from pre-reservation tribal custom, generally the tribe has the authority to modify tenant in-common practices. Allotment set in motion a number of circumstances: 1) individuals could sell (alienate) the allotment – under the Dawes Act, it was not to happen until after twenty-five years. 2) individual allottes who would die intestate would encumber the land under prevailing state devisement laws, leading to complex patterns of heirship. Congress has attempted to mollify the impact of heirship by granting tribes the capacity to acquire fragmented allotments owing to heirship by financial grants. Tribes may also include such parcels in long-range land use planning. 3) With alientation to non-Indians, their increased presence on numerous reservations has changed the demography of Indian Country. One of many implications of this fact is that tribes can not always effectively embrace the total management of a reservation, for non-Indian owners and users of allotted lands contend that tribes have no authority over lands that fall within the tax and law-and-order jurisdiction of local government. The demographic factor, coupled with landownership data, led, for example, to litigation between the Devils Lake Sioux and the State of North Dakota, where non-Indians owned more acreage than tribal members even though more Native Americans resided on the reservation than non-Indians. The court decision turned, in part, on the perception of Indian character, contending that the tribe did not have jurisdiction over the alienated allotments. In a number of instances – e. g., the Yakama Indian Reservation --, tribes have identified open and closed areas within reservations. One finds the majority of non-Indian landownership and residence in the open areas and, contrariwise, closed areas represent exclusive tribal residence and related conditions. It is important to recognize that Indian Country today consists of tripartite government – i. e., federal, state and/or local, and tribal. Where state and local governments may exert some, but limited, law-and-order authority, tribal sovereignty is, of course, diminished. This situation prevails in connection with Indian gaming, since federal legislation makes the state a party to any contractual or statutory agreement. Finally, other occupancy on reservations may be by virtue of tribal or individual tenure. There are many churches on reservations; most would occupy tribal land by consent of the federal government or the tribe. BIA agency offices, hospitals, schools, and other facilities usually occupy residual federal parcels within reservations. And curiously, many reservations include one or more sections ( approx. 640 acres) of school lands, granted to states at the time of statehood. As a general practice, such lands may sit idle or be grazed by tribal ranchers. The Indian Reorganization Act of 1934, also known as the Howard-Wheeler Act, was sometimes called the Indian New Deal. It laid out new rights for Native Americans, reversed some of the earlier privatization of their common holdings, and encouraged self-government and land management by tribes. The act slowed the assignment of tribal lands to individual members, and reduced the assignment of 'extra' holdings to nonmembers. For the following twenty years, the U.S. government invested in infrastructure, health care, and education on the reservations, and over two million acres (8,000 km²) of land were returned to various tribes. Within a decade of John Collier's retirement (the initiator of the Indian New Deal) the government's position began to swing in the opposite direction. The new Indian Commissioners Myers and Emmons introduced the idea of the "withdrawal program" or "termination", which sought to end the government's responsibility and involvement with Indians and to force their assimilation. The Indians would lose their lands but be compensated (though those who lost their lands often were not.) Though discontent and social rejection killed the idea before it was fully implemented, five tribes were terminated: the Coushatta, Ute, Paiute, Menominee and Klamath, and 114 groups in California lost their federal recognition as tribes. Many individuals were also relocated to cities, but one third returned to their tribal reservations in the decades following. In 1979, the Seminole tribe in Florida opened a high-stakes bingo operation on its reservation in Florida. The state attempted to close the operation down but was stopped in the courts. In the 1980s, the case of California v. Cabazon Band of Mission Indians established the right of reservations to operate other forms of gambling operations. In 1988, Congress passed the Indian Gaming Regulatory Act, which recognized the right of Native American tribes to establish gambling and gaming facilities on their reservations as long as the states in which they are located have some form of legalized gambling. Today, many Native American casinos are used as tourist attractions, including as the basis for hotel and conference facilities, to draw visitors and revenue to reservations. Successful gaming operations on some reservations have greatly increased the economic wealth of some tribes, enabling their investment to improve infrastructure, education and health for their people. Imre Sutton, "Cartographic Review of Indian Land Tenure and Territoriality: A Schematic Approach", American Indian Culture and Research Journal, 26:2 (2002): 63-113..
Imre Sutton, "Sovereign States and the Changing Definition of the Indian Reservation", Geographical Review, 66:3 (1976): 281-295. David J. Wishart and Oliver Froehling, "Land Ownership, Population and Jurisdiction: the Case of the 'Devils Lake Sioux Tribe v. North Dakota Public Service Commission'," American Indian Culture and Research Journal, 20(2): 33-58 (1996).